As New York City continues to struggle with embarrassing voter turnout, three pieces of legislation reintroduced in the City Council today take direct aim at the problem through reform. In an effort to increase registered voters in New York City, the first bill requires landlords to provide new tenants with a voter registration form along with the existing package of paperwork received when a new lease is signed. The second requires the City to take proactive steps to register its students to vote and comply with an existing law that requires each student to receive a voter registration form with their high school graduation diplomas. The third bill would change New York City’s archaic ballot access laws, which date back to the 1800s, allowing candidates to obtain entry onto the ballot by meeting the minimum threshold to receive public funds through the City’s campaign finance system instead of arbitrary signatures. New York, NY – Candidates for public office in New York City could entirely say no to contributions of $4,950 and rely entirely on small-dollar donations of $175 or less under legislation re-introduced by Council Member Ben Kallos. 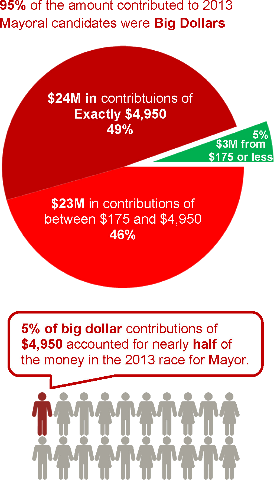 In the 2013 mayoral race, nearly half of all the money raised by Mayoral candidates were in contributions of $4,950, the maximum allowed under law. Under the current system, mayoral candidates receive 3,650 contributions of $175 or more from New York City residents in order to receive a full public match of $3.8 million, leaving a funding gap of $2.5 million to get to the spending limit of $7 million. Since these contributions are not matched with public funds, the system encourages candidates to seek non-matching big dollar maximum contributions -including from outside New York City- in order to fill the gap with as few contributions as possible. By eliminating the cap, the need for maximum contributions from big donors and special interests is also eliminated. This legislation was originally Introduction 1130-A in early 2016, ultimately reaching 32 sponsors and heard in committee but not voted on by the Council. Now, at re-introduction, it comes with the support of new Governmental Operations Committee Chair Fernando Cabrera and new City Council Speaker Corey Johnson, who pledged support for 1130-A at last year’s Citizens Union Forum. The bill already has the support of a dozen current Council Members including Andrew Cohen, Donovan Richards, Costa Constantinides, Stephen Levin, Helen Rosenthal, Raphael Espinal, Daniel Dromm, Brad Lander, and Justin Brannan. The legislation eliminates the arbitrary 55% cap on the amount of total campaigns which can come from public dollars. By doing so, candidates will, for the first time, have a path to fully fund their campaigns with only small dollars. Upper East Side, NY – Mayor Bill de Blasio and Sanitation Commissioner Kathryn Garcia at a Town Hall with Council Member Ben Kallos announced the New York City Department of Sanitation has agreed to limit the amounts of trash that will be processed by the Marine Transfer Station (MTS) and the number of garbage trucks that will pass through Upper East Side. The once industrial Upper East Side originally hosted both the East 91st Street Marine Transfer Station and a Sanitation Garage. The landmark asphalt mixing plant at East 90th Street was closed in 1968. The Marine Transfer Station at East 91st Street was part of a network of three Manhattan stations that processed 320 garbage trucks a day until it closed in 1999. The Sanitation Garage at 545 East 73rd Street housed 105 garbage trucks that would wake residents up at 4:30 AM, until the garage was demolished in 2008. In the 90s residents could see several hundred trucks a day and in the 2000s, over one hundred. A new letter from the Department of Sanitation commits to a much lower impact on the community from the new 91st Street Marine Transfer Station. "My deepest sympathy, thoughts, and prayers go out to the victims of the helicopter crash near Gracie Mansion. As a concerned resident and representative of this neighborhood, I will do my part to ensure that this type of tragic incident never happens again. The City must convene a permanent working group with the Federal Aviation Administration, State Department of Transportation, and other relevant agencies at every level of government along with industry and residents to investigate issues brought on by the helicopter taxi and tourism industry. The City must then come back within 90 days with recommendations to limit environmental impacts and improve safety for passengers. I will also be pushing the boundaries of preemption by Federal and State laws governing aviation as we seek to find a way to use New York City laws to keep our residents and tourists safe. The number one priority must always be safety and the necessary equipment for that must always be available to preserve lives." On this Valentine’s Day, Council Members and Transit Activists Ask De Blasio, Will You Be Our Bus Mayor? Transportation chair Rodriguez circulated the attached letter in recent days highlighting several fixes and policies Mayor de Blasio can implement to increase bus speeds and improve riders' commutes. A majority of council members signed on in support and doubled-down on their request today on the steps of City Hall, urging the Mayor to make turning around our failing bus service a high priority. "Mayor de Blasio must make improving bus service a top priority as quickly as possible," said Council Member Ben Kallos. "Whether it is more bus lanes, modernizing transit signaling systems to prioritize buses or simply speeding up the rollout of bus clocks throughout the five boroughs, New York City has no choice but to make these upgrades in order for our residents to compete globally in the workplace with the rest of the world. Thank you to Riders Alliance and Council Member Rodriguez for their continued fight for these implementable solutions to improve bus service." Read more about On this Valentine’s Day, Council Members and Transit Activists Ask De Blasio, Will You Be Our Bus Mayor? New York, NY — New York City Housing Preservation and Development (HPD) joined New York City Council Member Ben Kallos, Azimuth Development Group and development partners to celebrate the opening of a new 21-unit residential building located at 321 East 60th Street in the Lenox Hill section of Manhattan. The building is 100% permanently affordable to low-income households, for example individuals earning at or below $53,440 annually. Event attendees also included TD Bank, Aufgang Architects, and the New York City Housing Partnership Development Corporation. Upper East Side, NY – On Friday, January 26th State Senator Liz Krueger, Council Member Ben Kallos, Carnegie Hill Neighbors, and FRIENDS of the Upper East Side Historic Districts filed a lawsuit in New York County Supreme Court contesting the City’s approval of 180 East 88th Street, which is currently under construction. This building violates two zoning rules that apply to any building at this location: the sliver building rule, which prohibits tall towers on narrow lots, and the “tower-on-a-base” rule, which requires any building fronting on a side street to have a base along the street line that roughly matches the height of its neighbors, so as to preserve the continuity of the block. The building was approved because of a piece of chicanery that, if accepted as a precedent, would nullify these two zoning rules entirely. The developer, DDG Partners, created a tiny new tax and zoning lot fronting on 88th Street, initially only four feet deep and later enlarged to ten feet. The developer then transferred title to this sham lot to a sham entity, created only for the purpose of owning this lot. This sham lot cannot be built on; both because it is too small and because the Building Code requires that it be kept clear as an emergency exit from the new building. Through this ploy, the developer claims the property no longer fronts on 88th Street, and so does not have to comply with zoning rules that would prohibit such a sliver building. Full Public Match: former Introduction1130-A Eliminates the arbitrary 55% cap on public funding of elections and allows every small dollar raised from city residents to be matched at 6 to 1. By doing so we are creating a path for candidates to run competitive elections that reach the total spending cap on contributions of just $175. Doing so eliminates the need to seek max checks from millionaires and incentivizes candidates to seek small donations from within the neighborhoods they seek to serve. Young Adult Voter Registration Act (YAVRA) former Introduction 628: To ensure compliance with existing law that requires graduating students receive a voter registration form with their diploma, the legislation requires those registration forms contain a unique code the City can scan to determine which schools are complying with the law and helping their students get registered to vote. Additionally, the Department of Education would be required to report annually to the Council on their efforts to comply with the law from borough to school level, with details including the number of eligible students, the number of forms distributed by language, and the number completed and returned. New York, NY – New York City tenants who go to housing court could receive protections from the so-called “tenant blacklist” under legislation re-introduced yesterday by City Council Member Ben Kallos. Tenant screening companies, which create “tenant blacklists,” would be regulated to ensure they provide fair and complete information, including court records that show when tenants were in the right. Landlords would also be prevented from using the information to discriminate against tenants when the terms of an order issued in housing court have been satisfied. Together this legislation will lessen the number of prospective tenants denied a place to live merely because they were involved in a housing court case. Hundreds of thousands of New Yorkers named in housing court cases every year are reported to be on “tenant blacklists.” These “blacklists” are created by screening reports sold by companies along with credit reports and are often used to deny applications to renters. Tenant screening companies who provide a list of those named in housing court cases without any indication of the particulars or outcome of the case include CoreLogic SafeRent, TransUnion Rental Screening Solution, On-Site, and ALM. (New York City – December 28, 2017) Representatives from the City’s Department of Design and Construction and NYC Parks Commissioner Mitchell J. Silver, FAICP, joined City Councilmember Ben Kallos on Thursday to celebrate the opening of the East 81st Street pedestrian bridge, connecting the East River Esplanade at the lower level to the promenade at the upper level, known as the John Finley Walk. New York, NY – More than 7,700 scaffolds entomb 280 miles of City sidewalks may soon be dismantled, under legislation introduced by Council Member Ben Kallos in 2016 and to be reintroduced on Wednesday, January 31, 2018. Unnecessary scaffoldings also known as “sidewalk sheds” would have to be removed if seven days pass without construction work with a six-month limit to complete necessary repairs. Sidewalk sheds are temporary structures, made of wooden planks, boards and metal pipes to protect pedestrians from dangerous conditions that are being corrected or new construction. Scaffolding is not only an eyesore but attract crime such asdrug deals and provide an alternative to shelter for homeless. Sidewalk sheds meant to keep residents safe have become a danger in themselves as they collapse on pedestrians in Manhattan and Queens causing injuries. In spite of these collapses, many sidewalk sheds persist for years, sometimes more than a decade, with one almost old enough to vote. Good afternoon and thank you for the opportunity to testify. I am Ben Kallos, Council Member of the 5th District and author of Introduction 1130-A, a piece of legislation I introduced in 2016 along with 31 of my colleagues and a diverse group of advocates ranging from good government to labor to academics to women’s organizations to organizations representing low income communities. As we discuss the 2017 city elections I am here today to ask that the Campaign Finance Board include this legislation, which will be re-introduced at the January 31st Stated Session, as one of its recommendations in its forthcoming mandatory post-election report. New York City has the model public finance system in the country. It is a system that has survived court challenges, helped me get elected, and one that I am invested in protecting and improving upon during my time in the City Council. For anyone here or watching on the live-stream who may not be fully familiar with the system: New York City’s campaign finance system matches the first $175 of contributions from city residents at a 6:1 ratio and gives participating candidates a partial public matching grant of up to 55% of the total spending limit in competitive races. Thank you for your continued advocacy and partnership in implementing the city's equitable and environmentally sustainable Solid Waste Management Plan. When fully implemented next year, this plan will reduce greenhouse gas emissions by 34,000 metric tons and reduce annual truck travel by more than 60 million miles annually. The marine transfer stations called for in the plan are designed to be state-of­the-art facilities with negative air pressure systems, rapid roll-up doors, odor control systems, a refuse processing floor 16 feet above the water line, and the shipment of waste by barge in sealed containers. These facilities are designed to be the very best possible neighbors. This is not the East 91st Street Marine Transfer Station of years ago. I am pleased to report that thanks to your work and more importantly the great recyclers in your community, the amount of refuse processed at the MTS will be lower than anticipated during the planning process. The E. 9st Street MTS will take residential waste collected by DSNY only in community districts 5, 6, 8 and 11. In 2003, these four community districts produced more than 720 tons per day of refuse. Last year, the same districts produced less than 540 tons per day. Simply put, less trash means fewer trucks. Based on our most recent analysis, the number of trucks received at the facility will range from a low of 37 on Fridays in March to a peak of 63 on Tuesdays in May. On most days, the MTS will receive on between 40 and 50 trucks. In addition, approximately 8 trucks will dump litter basket waste overnight. New York, NY – Landlords failing to provide required affordable housing in exchange for city financing, tax breaks or additional density will have to register their units and offer new and existing units to residents for rental in one location or face escalating fines under legislation that aged into law Friday, following its passage by the New York City Council in December. Introduction 1015-A, authored by Council Member Ben Kallos and sponsored by Manhattan Borough President Brewer, and Housing and Buildings Chair Williams was introduced in response to a ProPublica report estimating that New York City has paid developers $100 million for 50,000 affordable units that might not be offered for affordable rates. New York, NY – Today the City Council passed legislation forcing the Department of Education to report the number of children from each neighborhood who apply to attend a particular school, the number of seats available at each school, how many offers of admission were made, and total enrollment in all public schools. The legislation authored by Council Member Ben Kallos will show the current geographic diversity in NYC schools, whether there are sufficient numbers of school seats in each neighborhood, and how many children are being turned away from the public school system because the City lacks the capacity to allow children to attend school in the neighborhood in which they live. New York, NY – On Tuesday, December 19, 2017, the New York City Council passed several bills endorsed by the Progressive Caucus in its current session policy platform. Including the bills passed today, the Caucus and its members have sponsored and advocated for the passage of nearly 50 bills representing crucial advancements in progressive issues including tenant safety, workers’ rights, affordable housing, and community safety. The bills passed today endorsed through the Progressive Caucus’ Current Session ‘Advancement Agenda’ include: (1) Community Land Trusts (I. 1269), which amends the administrative code of NYC as it relates to creation of regulatory agreements with community land trusts; (2) Asthma Allergens (I. 385), which calls to regulate indoor asthma allergen hazards in residential dwelling and pest management; (3) Right to Request Flexible Schedule (I. 1399), which protects employees who seek temporary changes to their work schedule for personal events and certain scheduling changes; (4) Right to Know Act, a legislative package that aims to protect the civil rights of New Yorkers while promoting communication, transparency and accountability for everyday interactions between NYPD and the public; and (5) Automatic Benefits (I. 855), which would support a study regarding the feasibility and cost of utilizing City administrative data to determine individuals who are likely eligible for public assistance and to provide electronic notices of eligibility. The nearly 50 passed bills endorsed by the Caucus are listed at the end of the release. New York, NY – Landlords failing to provide required affordable housing in exchange for city financing, tax breaks or additional density will have to register their units and offer new and existing units to residents for rental in one location or face escalating fines under legislation that passed the New York City Council yesterday. Introduction 1015-A, authored by Council Member Ben Kallos and sponsored by Manhattan Borough President Brewer, and Housing and Buildings Chair Williams was introduced in response to a ProPublica report estimating that New York City has paid developers $100 million for 50,000 affordable units that might not be offered for affordable rates. New York City and State for decades have failed to hold landlords and developers accountable for agreements like 421-a, J-51, and Article XI. In 1993 New York State eliminated penalties for failing to register, allowing thousands of building owners to ignore the law for years and charge rents above the legal limit. These programs provide direct financing, decades-long tax abatements, or additional density to landlords and developers in exchange for building and maintaining affordable housing units whose tenants have income that meet a certain percentage of the Area Mean Income. Together these programs cost the city roughly $1.2 billion per year in tax revenue, but much of the affordable housing is getting lost. ProPublica found that owners of 15,000 buildings — receiving over $100 million from the city — failed to register any affordable units, leaving New Yorkers roughly 50,000 units short of what they paid for. After hearing this legislation, Mayor de Blasio identified 37,141 apartments that were avoiding $304 million in property taxes while failing to comply with the 421-a affordable housing program. New York, NY - On Tuesday, December 19 the New York City Council passed legislation to study the cost and city’s technical ability to provide pre-filled applications for assistance programs and proactive notice to potential applicants in an effort to sign up more residents who already qualify, but do not participate. Assistance for low-income New Yorkers who are in need of hunger, housing, health, childcare, or 40 other assistance programs through notifications and pre-filled applications will be studied by the city, under Introduction 855-B authored by Council Member Ben Kallos and passed by the Council. 550,000 of the 2.3 million New Yorkers who qualify for the Supplemental Nutrition Assistance Program (SNAP) are not getting it, according to the city. In 2011, Community District 8 on the Upper East Side, represented by Council Member Ben Kallos was first in the city for SNAP under-enrollment with 91% of eligible seniors not enrolled, according to LiveOnNY. New York, NY – Noise is the top complaint in New York City with booming construction surrounding residents who complain only to see their concerns go unaddressed for days or met with a small fine paid by developers as a cost of doing business. After hours noise will be targeted with new rules for responding when the noise is still happening or is likely to happen again, turning down the volume on after hours construction noise in residential neighborhoods over the next two years, and empowering the Department of Environmental Protection (DEP) to shut down equipment that is too loud. Introduction 1653-B was authored by Council Member Ben Kallos in collaboration with DEP who helped improve it and co-sponsored by Environmental Committee Chair Costa Constantinides, which passed that committee and is on track to pass the City Council today. In 2016, violations went down as complaints went up, according to the New York Post. Analysis found that noise complaints peak dramatically after 8PM then falls after midnight with a second increase between 7AM and 9AM according to Pratt Professor Ben Wellington in The New Yorker.